A Stratfor report from 2007 on the whole PKK structure, which was published by WikiLeaks, revealed the PKK, which is recognized as a terrorist organization by the U.S., EU and NATO, is engaged in drug and human trafficking, robbery, counterfeiting, abduction of children, money laundering and other organized crimes and supported by certain European countries. The PKK has a budget of about $86 billion. Indicating that the PKK aims to draw international pressure on and antipathy toward Turkey one way or another, the report claims that some EU member states have supported the terrorist organization either directly or indirectly. 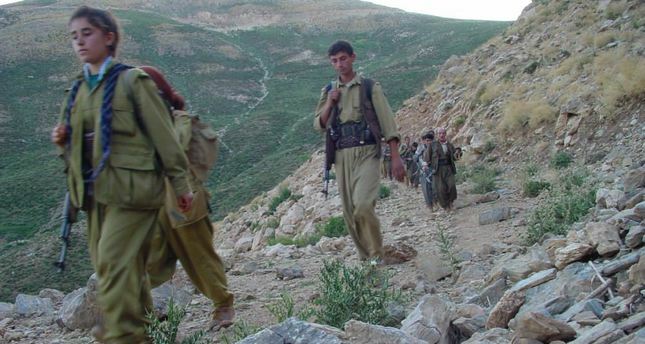 Defining the PKK's sources of revenue, the report reveals astonishing facts regarding the huge sources of revenue from almost all kinds of narcotics trafficking. "The PKK is engaged in producing, refining and marketing of drugs and has contacts in numerous countries," the report says. The PKK's annual turnover from drug trafficking is also estimated to be $300 million to $400 million. According to a German chief prosecutor's assertion, the PKK or "other groups" account for 80 percent of the narcotics seized in Europe. Additionally, the PKK taxes other Kurdish groups engaged in drug trafficking across Western Europe. Human trafficking is also emphasized in the report, with which the PKK derives a remarkable amount of profit. Main routes used by the terrorist organization are Istanbul to Milan, Istanbul to Bosnia to Milan and Turkey to Tunisia to Malta to Italy. Hopes of those willing to work in Europe illegally are also fulfilled by the PKK, smuggling people in despair. While the PKK uses the money earned mainly from drug and human trafficking to buy arms to spread terror in Turkey, the question of which banks and countries help the terrorist organization launder the money and privately keep it is also answered in the report. "Banks in Belgium, Cyprus, Jersey in the U.K., and Switzerland provide privacy for PKK funds; monetary transactions are done through the hawala system or by cash couriers," the report claims. President Recep Tayyip Erdoğan's claim that the West "has always condoned" the PKK has also proven right according to the report. In addition to the aforementioned countries where the PKK is given the opportunity to keep its money and carry out monetary transactions, the imprisoned leader of the PKK, Abdullah Öcalan, "enjoyed the support of leftist parties in Italy, France and Greece." The KGB, the main intelligence agency in the Soviet Union until 1991, provided assistance to the PKK in its deadly attacks against Turkey. Serving as foreign minister, head of the Supreme Soviet of the Soviet Union and chief of the intelligence service, Russian politician Yevgeny Primakov is described in the report as a firm and longstanding PKK supporter. Moreover, U.S. intelligence uncovered evidence in 1996 that linked the Greek government to a training program for an international terrorist organization, which afterward was dismissed by Athens. EU member states have been responding negatively to extradition requests from Turkey for PKK terrorist. Of more than 600 rejected requests, Germany ranks first in the standing with over 300 refusals. Speaking to Daily Sabah, a former member of European Parliament and Daily Sabah columnist, Ozan Ceyhun, commented on the tolerance of EU member states regarding the PKK and its criminal activities in Europe. He said: "Even though EU member states are aware that the PKK conducts criminal activities such as drug and human trafficking, they turn a blind eye when it comes to stopping the terrorist organization." Claiming that police departments in EU member states prepare reports with respect to drug trafficking statistics in their own country, Ceyhun said: "They don't reject or dismiss the claims. In practice, they allow the PKK an area of activity for some reason. It is the biggest support they can provide." Pointing to the aforementioned statistics regarding un-extradited PKK terrorists in Europe, Ceyhun criticized EU member states and made a comparison saying: "They treat these terrorists like they are political refugees, which is a mistake. If an ISIS [Islamic State of Iraq and al-Sham] militant applied to Germany for asylum, he would be rejected. Should he get the asylum and the U.S. wants to extradite him, Germany would immediately return him. It is unacceptable." Vahap Coşkun, an associate professor at Dicle University, also spoke to Daily Sabah about the assistance the PKK receives from some EU member states. "The PKK has connections with countries around the world and it is obvious that they are backed in this regard," he said. Emphasizing examples of states in history that interfere in the internal affairs of another by secretly supporting terrorist organizations, Coşkun pointed to the close alliance between the PKK and the West.